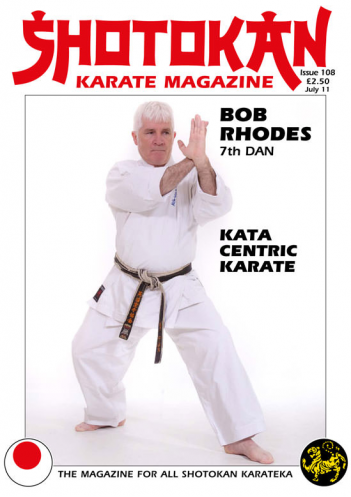 I've wanted to feature an interview with sensei Bob Rhodes for many years but never seemed to get around to it until now. Bob is a vastly experienced karateka and a long time senior instructor with the KUGB (Karate Union of Great Britain). I personally remember training with him (when I was a member of the KUGB), on various KUGB courses all over the country, many years ago (early 1980's) and I always thought that his ideas and training were quite unique, even then. He was doing unusual and interesting partner kumite drills and kata application (bunkai) long before it became 'in vogue' and his teaching of ashi barai was superb. I'd never been taught ashi barai in such detail and with such a skill element before; it was usually just try and smash their leg from under them with no thought to body positioning and technique. This was a technique that Bob Rhodes specialised in. He was also very approachable and helpful. I especially remember his excellent demonstrations at the KUGB National Championships. Sensei Rhodes was the Chief instructor at the Leeds (UK) dojo for over 30 years. This was one of the toughest dojo in the country, without doubt. Bob Rhodes was part of the first 'Golden Era' of KUGB karate in the UK under the guidance of the late Enoeda sensei and Andy Sherry, with instructors and competitors the likes of, Steve Cattle, Terry O'Neill, Bob Poynton and Billy Higgins, all household names in the history of British Shotokan Karate. 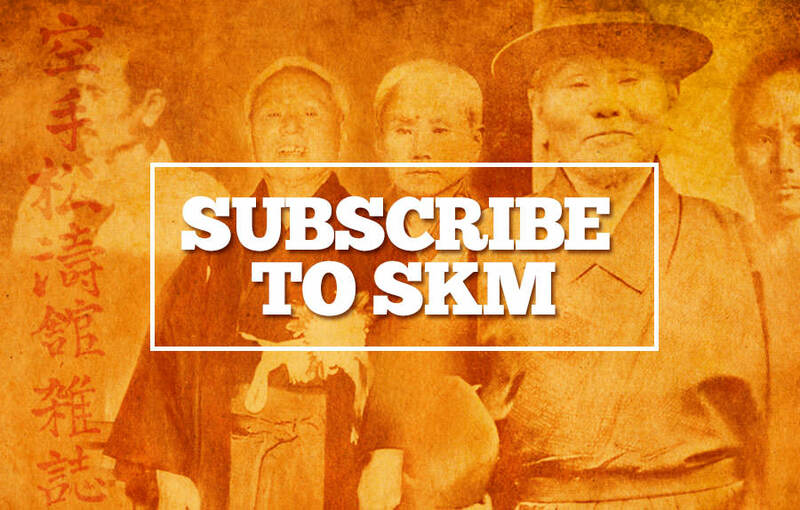 I want to thank Simon Oliver for arranging and conducting the interview for SKM. Our second interview in this edition features sensei Neil Sargent a pioneer of Shotokan karate-do in Ireland who opened his first dojo in February 1970. I like to feature these types of instructors who I call the 'Unsung Heroes' of karate. We have a couple of technical articles in this edition which many readers request. It may seem to many people, to be nothing new, but I think that always there is something to learn from such articles, even a small point that maybe is coming from a different perspective or angle from your own. Of course technical articles are no substitute for hands-on practice with a good instructor but hopefully they can sometimes plant a seed for the future or make you think, "Ah! that's a new way of looking at that." And many times such articles are interesting for instructors at club level. It's like learning a technique: although it might be the exact same technique, each instructor will have a different slant and approach to teaching that technique, otherwise we would all be robots! I remember vividly being taught ushiro geri by several different instructors and each had a different way for both performing the technique and teaching it, even though it was the same technique. Like sensei Mikami stated in the last issue, always keep an open mind! THE IMPORTANCE OF MIGI AND HIDARI IN KARATE-DO. By Kieran O'Reilly. I am a passionate Shotokan karateka with 15 years of training and have had the pleasure to train for an extended time at the JKA honbu in Tokyo, as well as cross training with others such as famed MMA fighter Kid Yamamoto and Christiano Cariaco - Jiu Jitsu coach of UFC Light-Heavyweight Champion Shogun Rua. I am currently studying for a history degree and during the break between terms am working on some articles to relate some of the more important lessons I have learned in my time training Shotokan. Karatedo as a fighting art is unique, particularly among striking arts, due to its emphasis on ambidexterity in technique and stance. Whether consciously recognized by the practitioner or simply drilled into him by repetition of a grading syllabus that requires kihon and jiyu ippon kumite to be performed from both left (hidari) and right (migi) leading stances – the majority of karateka develop a number of techniques which they can throw comfortably from both stances. This ambidexterity of technique has lead to karate's trademark elusiveness – allowing exponents to literally run backward and counter-strike or shift to a dominant angle with either foot forward – and an unparalleled unpredictability among a number of its most high profile exponents in combat sports. Master Tsutomu Ohshima above (left) said it best when he related in his Notes on Training that, Karate is the Martial Art practiced from the widest distance possible without weaponry. Stressed from the days of Ankoh Itosu and his perfectly symmetrical re-interpretation of Naihanchi and Pinan kata and accentuated further by Funakoshi's now rarely practiced Taikyoku kata, karate's emphasis on duality of stance began more out of desire for even muscular development in the days of it being instituted as a physical education method in Japan's middle schools than out of any sense of practicality. Indeed, the familiar, wider fighting stance was a later development and looking back even a hundred years one can see traditional Okinawan Te was more to do with self defence from an almost shoulder width, standing stance than from a prepared striking position. The development of the wider stance and emphasis on movement and kicking has revolutionized the way karate is practiced and with the advent of free sparring (jiyu kumite) on the Japanese mainland under Mas Oyama, Gigo Funakoshi and other young guns, techniques now had to be landed on moving targets who weren't grasping the practitioner or even in striking range (Tsutomu Ohshima said it best when he related in his "Notes on Training" that Karate is the martial art practiced from the widest distance possible without weaponry). One need only look at local competition footage to realise the dual dependence on both left and right stances most karateka have developed. The majority of competitors gravitate to a position that places the opposite foot forward to their opponent e.g. their right stance to their opponent's left stance, this is referred to by Masahiko Tanaka in his ground-breaking publication "Perfecting Kumite" as open guard (gyaku gamae). By mirroring the opponent's stance the karateka makes a barrier with his front foot and knee that serves to maintain distance until he chooses to step outside of his opponent's lead foot and deliver his attack. Though present from the lowest level of competition this tactic has carried the careers of Alexandre Biamanti and even those karateka who compete in full contact sports such as the legendary Swiss Kyokushin exponent Andy Hug, and current Mixed Martial Arts phenomenon Lyoto Machida. The unique method of training both stances to a comfortable degree of dexterity means that a karateka can easily accommodate an opponent of boxing, kickboxing or muay thai background regardless of his orthodox or southpaw stance providing his opponent remain tied to that single stance. While the training of both stances is present in every karate dojo in every country in the world, it is still remarkably rare in other martial arts. Boxing superstars Marvin Hagler and Prince Naseem Hamed were not phenomenal pure boxers from either left or right stance, but by combining the two and moving smoothly between them both were able to hit their opponents from a remarkable number of angles with startling frequency. This unpredictability also led to them both garnering substantially more impressive knockout ratios than their peers. In mixed martial arts (MMA) competition the Japanese banger Takanori Gomi and Brazilian Muay Thai technician Anderson Silva have both cut careers out of a willingness to change stance not just mid-fight, but mid-combination – a staple of most karate techniques and combinations, but rarely – if ever – seen in Muay Thai, MMA or pugilistic competition. Indeed, the current absence of traditional karateka from the top ranks of kickboxing and MMA competition is more down to a lack of cross training and conditioning than to an ineffectiveness of style. Lyoto Machida mixing Shotokan and UFC. The use of both open guard: the position with opposite foot forward to one's opponent, and closed guard (ai gamae); that with the same foot placed forward, allowing a closer distance with more openings for the lead hand and foot than the rear – is an important part of a karatekas arsenal, yet few realise that they are doing it. One of the few to put this concept into words and principles is the legendary JKA master Masahiko Tanaka in his unequalled tome "Perfecting Kumite" – yet when one goes to a kumite seminar one will normally be taught a random assortment of effective but unrelated techniques from both open and closed guard position without any mention of why one would be there. This relates to the attitude of most karateka even at the highest level – all have techniques from left and right stance, but cannot necessarily use the same technique from both stances comfortably. What one often gets then, is a random assortment of techniques from a random assortment of positions which are thrown on feeling or hunch rather than science. This is not to say such karateka are wrong, the human brain simply isn't designed to be ambidextrous – it naturally learns to express itself better with one side of the body, in fact, the archaic practice of forcing children to learn to write right-handed regardless of their southpaw natural preference has now been deemed akin to child abuse – linked to severe mental repercussions and nervous disorders. It is healthy to learn techniques of both sides that one is comfortable with and round out one's fighting style, but it is by no means reasonable to assume that the same techniques should be easily accomplished from an open guard position with the combatant's right legs forward as an open guard position with both combatant's left leg forward. Ultimately karatedo is a martial art, that is not just a how-to guide with easy to follow steps, it is a series of techniques and forms from which your personal tastes, experiences and makeup cause you to gravitate toward a few. It is beautiful because it is flawed and individual. Boxing, kickboxing and Muay Thai coaches berate an individual for dropping his hands, pulling away from punches, changing stances or landing with the kicking foot forward; yet all of these are common practice in Karate and all unorthodox and effective tactics if the time is put in. Indeed Lyoto Machida – the former UFC Light Heavyweight Champion – is a brilliant Shotokan Karateka from JKA Brazil (featured in SKM No. 103) and throws techniques from both stances almost exclusively off his left side, while pulling away from punches or running straight backwards – yet he has put on some of the most impressive performances in mixed martial arts history while remaining the least hit competitor on average in the UFC. Unorthodox and flawed or not, isn't the ability to hit and not be hit what the martial arts are really all about? Changing stances not only offers a whole new set of attacks, a difference in position for one's power techniques and a better ability to create angles – it provides the foundation for an untouchable method of defensive movement. It is unique among striking arts, and one of karate's – particularly Shotokan's – more beautiful querks.